Finz is open from 5 pm daily. 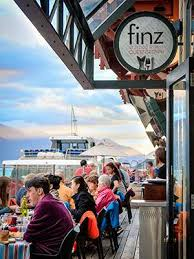 Finz Seafood Restaurant & Grill has a great location right on the waterfront in the upmarket Steamer Wharf Dining precinct in Queenstown where you can watch the TSS Earnslaw Steamship head off on her cruises and keep an eye on people strolling along the Wharf. Whilst specializing in seafood, Finz will also tempt you with cuts of Prime New Zealand Beef and Southland Lamb. All ingredients used to create these tasty seasonal dishes are selected by the Chef Owners from the wonderful array of premium produce on Queenstown’s doorstep. 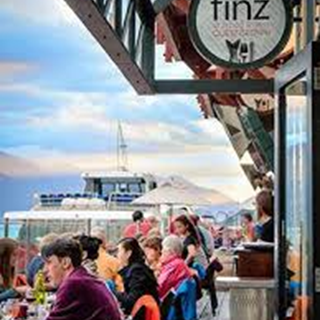 Finz has been a popular choice with Queenstown diners for over 11 years and offers a unique dining experience right on the lakeside. Best place to dine if looking for sea food option. Consistently good service, food and drink. All the dished we had at our group were delcious, in particular the salt and pepper squid. I will certainly visit again and highly recommend Finz to friends. Had a great evening. All the food was delicious- especially the fish tacos and lamb rack. All the staff were helpful with suggestions and knew the menu well. Will be returning again. I found the atmosphere pretty quiet and unapproachable, the staff were very friendly and attentive though. I found the food over priced for what it was, unfortunately it was nothing special and I was hoping for a bit more! We expected this dinner to be good, but it wasn't .....it was EXCEPTIONAL!! The setting of this restaurant is superb right outside where the Earnslaw docks and I wonder if Finz is therefore resting on their laurels a bit. Our service was excellent but this was let down by very very average food. All four of us were disappointed with our meals. Mine was dry and tasteless, some was over cooked and others generally unhappy with what the chef had put together. Finz, you used to be better than this. My wife and I celebrated our wedding anniversary dinner here. The meals were great (I had the steak and she had the fish and chips)the service was warm and helpful. And the little extras that was provided (champagne on arrival and dessert) just made the night that much special. Thanks for dinner tonight we had a great time. We booked Finz because we had visitors who were gluten free, pescatarians and the menu cated for these specific needs. The atmosphere and staff were great, however there were so many things that were off the menu because they had run out. It had been a cold wet day so perhaps people had spent their time eating in  the restaurant during the day but it was disappointing as everything we wanted was out of stock... however the food was great but limited as a result. Fabulous food with generous sizings. The service was excellent. We appreciated the fact our comment on the online booking had been noted re sitting next to the window. Highly recommend this restaurant, especially if you love seafood. Great service, friendly and attentive staff members. Food was wonderful and served in a timely manner. Will definitely recommend to friends and colleagues. Friendly staff and amazing food with gorgeous views of the lake. The manager was one of the best I've seen for a while. Restaurant was REALLY noisy. Had to shout to fellow diners to be understood. Great food but more a cafe atmosphere than a fine dining one. Everything was absolutely perfect. My husband and I still agree that Finz served us the best food we have ever eaten and our kids all finished their meals. Thank you for your wonderful service. Delicious food and great service. Will  definitely recommend to friends. Great! Love the way the waiters being interactive and the view is awesome. Just better remind your customers if some stuff is running out soon.